Home Uncategorized Hop, Hop Hurray! Hi everyone!! My name is Shawnee from Blessed on the Bright Side and I am proud to be the guest designer for this week!! I love being on the Crafty Card Gallery Design Team. My card for today is a card for a friend of mine to make them smile. I used Create a Critter which is one of my favorite cartridges. I love the adorable animals on this cartridge and use it often in my projects. I also used some beautiful recycled paper from DCWV. It’s a more manly stack of cardstock which works for this card and for me most often as I have 8 boys to make cards for. My sentiment is from CardzTV Stamps TOAD-ALLY AWESOME stamp set. 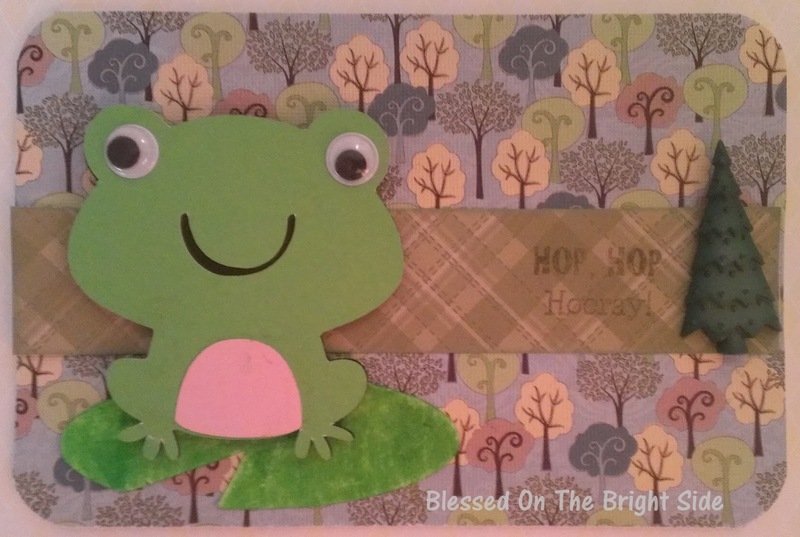 I stamped the inside with a cute frog from this same set and wrote a message that I am praying for my friend. I know they will love this card just as much as I do. I hope you enjoyed this fun creation! !